24 Replies to "READY FOR THE STORM? Thursday night notes, including bus cancellations"
I was just at Home Depot @7:30PM. They had snow shovels but no firewood or de-icer. I did not know that. Thanks for that information!!! Epsom salts sure didn’t work for me! You can also use kosher salt! QFC in the junction had quite a lot of firewood when I was there two hours ago.Also, everybody was pleasantly civil to each onter in the long lines! Including the staff! They were working hard when I was there and were still friendly and positive! Costco encourages you to pull up to any side pump because their hoses reach. Keeps the lines moving. Non clumping cat litter works for traction on steps and sidewalks after shoveling. Sweep it up after the thaw, a good back up plan of there is no de icer to be had. Thanks for the updates, WSB! Any possibilities of power outages that could result from this storm? There’s always the possibility. Tree branches falling due to weight of snow, people sliding out from ice and hitting poles or utility boxes with their cars. Those are typically how power outages happen during snow/ice storms. Give first responders and utility crews extra space and slow down. We still have lots of firewood, duraflame logs, ice, lighters, matches, water bottles, etc at the West Seattle QFC in the junction. We open at 5am and will maintain regular business hours all weekend during the storm 5am-12am. Even if there are power outages we will remain open regular hours. 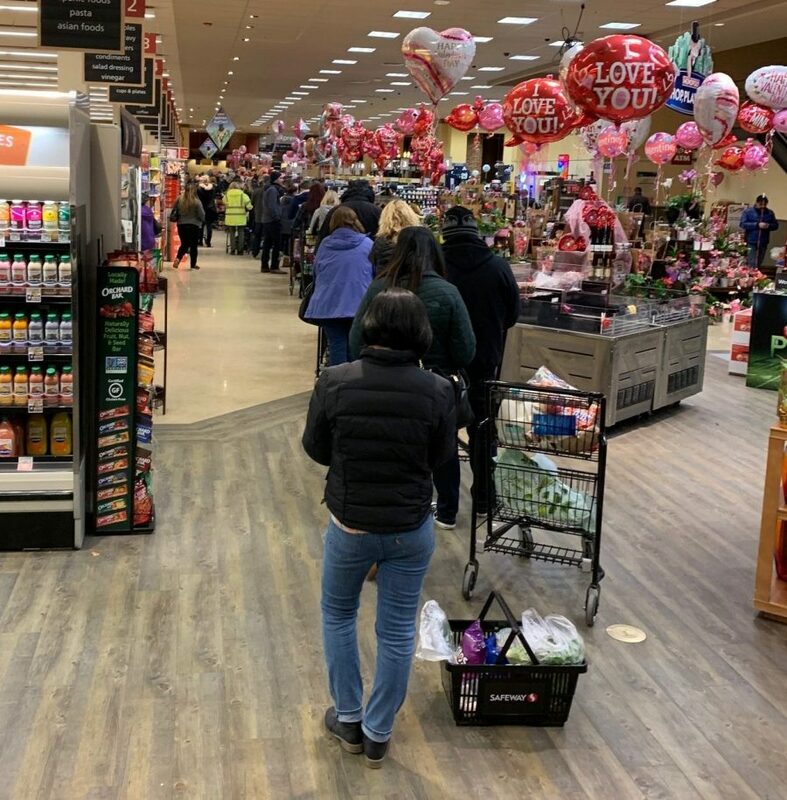 Safeway at Jefferson Square was a zoo last night around 4…no carts, people waiting for parking spots, 15 minutes to check out. At least folks seem to be more prepared for this storm. Salt your stairs if you can to prevent ice; I had a nasty slip on Tuesday and am still smarting….stay safe everyone! I’m prepared to take photos of motorists that can’t be bothered defrosting their windows completely before driving or those motorists that remove a postage stamp size amount of snow from the drivers side windshield and think their good to go. Metro noted buses in for repair due to snow chain damage (among other things) as a reason for route cancellations. I rode on buses earlier this week that still had chains fitted even though roads were bare. That’s just asking for damage. I’m unable to comment on the Friday pm updates so i’m commenting here. I’m not sure you anyone knows about LEST, its an event where lutheran schools go to portland and compete in basketball, drama, swim, etc and Hope Lutheran is supposed to go, but it’s snowing all this week. How much do you think it would snow? Would it stick?